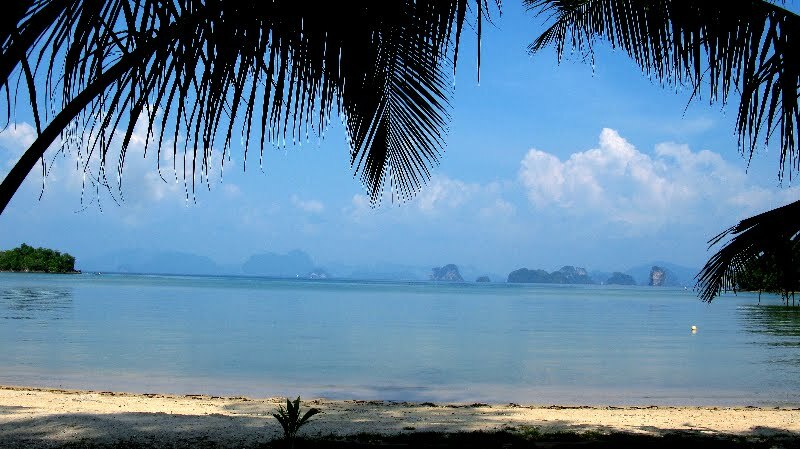 Over seven and a half weeks I visited 23 islands and over a dozen mainland beaches along Thailand's Andaman Coast. My purpose: to update Lonely Planet's Thailand guidebooks. It was of course a pleasure getting to re-visit one of the world's most beautiful regions, but it was also exhausting moving around so fast and often it was disheartening to see how over-run with tourism many places have become. As time went on, the beach of my own personal vacation dreams seemed more and more elusive. Ko Phi Phi, a strong contender for most stunning island on the planet, is the poster child of my dilemma. The island has been a tourist favorite since the 80s but ironically it was Alex Garland's book The Beach that made it go from busy to spoiled. The film version, starring Leonardo DiCaprio was filmed on Phi Phi and now that site of the mythically quiet strip of perfect white sand in the middle of a national park is descended on daily by hundreds of tourists in uncountable boats. Worse, these tourists toss their cigarette buts and beer cans into the water and are generally loud, drunk, unsmiling and rude to the locals and each other. But if you look over their heads and wear earplugs, the view sure is nice. 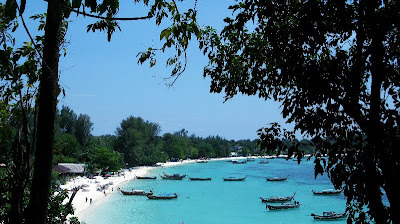 The saddest place for me was Ko Lipe that only four and a half years ago (the last time I visited) was still a place where you could find a bamboo shack on the beach for $8, dazzled, conscientious travelers and plenty of empty stretches of beach. Since I was last there, a tourist super highway has been built connecting the two main beaches and every block of beach has a resort built on it. The sea gypsy islanders who were one omnipresent have been cordoned off in a village towards the middle of the island. On the site of my old bamboo bungalows of yesteryear are three concrete resorts. 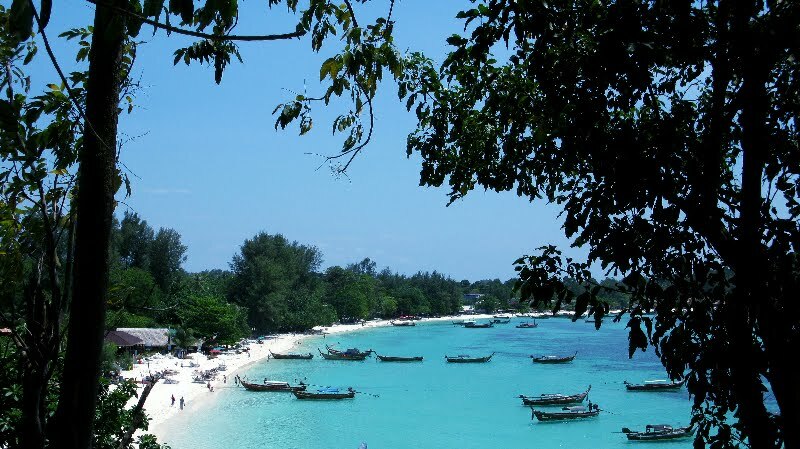 The visitors to Lipe are a cross-section of package tourists and twenty-something flashpackers - a step up from the rowdy sunburned Phi Phi crowd, but degrading quickly just the same. So when people ask me what beach to go to in Thailand what do I say? Luckily there are still a few places that remain relatively un-crowded but honestly I don't have much hope of them staying that way. Ko Bulone Leh right near Koh Lipe is still mostly owned by locals who run inexpensive bungalows and has beautiful beaches sans rows of beach umbrellas; Ko Jum near Ko Lanta is quiet as can be with long stretches of grey white beach and a lively population of local fisherfolk; Ko Payam near the Myanmar border has seen a lot of development over the past few years but most of it is tucked away in the trees and is locally owned so you hardly notice it's happened - pick between the lively backpacker beach or the quiet and far more beautiful white sand beach to the north. But it wasn't until the last day of my trip that I found my perfect beach, the place I would actually pay to go to and bring my family. 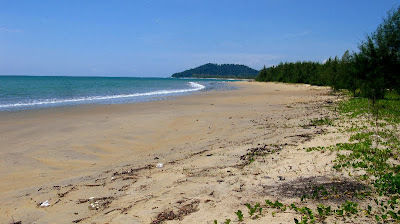 No one has really heard of Ko Phratong and I hope it stays relatively unknown (no, not that many people read my blog). There is no regular transportation and the only resort, The Golden Buddha, is a yoga retreat attracting lovers of peace and quiet. But I wouldn't go to the Golden Buddha. No, I'd go to the totally unknown bamboo thatch huts of a certain motorcycle-riding Thai hippy named Mr Chuio (http://www.mrchuoibarandhut.com). Not only are his bungalows tucked slightly inland from an empty white beach with chalky-blue water and two small beach-laden mini-islands a swimmable distance from shore, but Mr Chuoi's place has style. He propagates rare orchids found around Ko Phratong and hangs them around his "resort." The bungalows are decorated with paper flowers and shell mobiles handmade by the man himself. Then there's his bar. The island is home to a few community based tourism projects and a dive club (at the Golden Buddha) and everyone who's looking knows that fun times are to be had at Mt Chuoi's - nothing loud and obnoxious, just fun. The locals like tourists thanks to the community based tourism and there are all sorts of fun projects to get involved in from turtle conservation to fishing. Yup, this is where I'd like to turn up and stay a few weeks. It's the kind of place where you'd know half the people on the island by the time you left. I'm saving up already. It will be in the next Lonely Planet but Ko Phratong with it's lack tacky T-shirt shops, girly bars and transport isn't likely to attract the tourist throngs too soon.